It has been 12 years since conductor Daniel Barenboim last stepped onto the podium at Symphony Center to lead the Chicago Symphony Orchestra. And the orchestra’s mighty massing of stellar musicians has shifted considerably since he served as its music director from 1991 to 2006. But on Monday, at an intimate press conference celebrating his return visit to the city, Barenboim expressed his delight at what will be a two-part homecoming. First, he will stand in front of the CSO again for three performances (Nov. 1, 2 and 3) of “Ma Vlast” (“My Homeland”), a collection of six symphonic poems by the 19th century Czech composer Bedrich Smetana that evoke the history, legends and landscape of Bohemia. 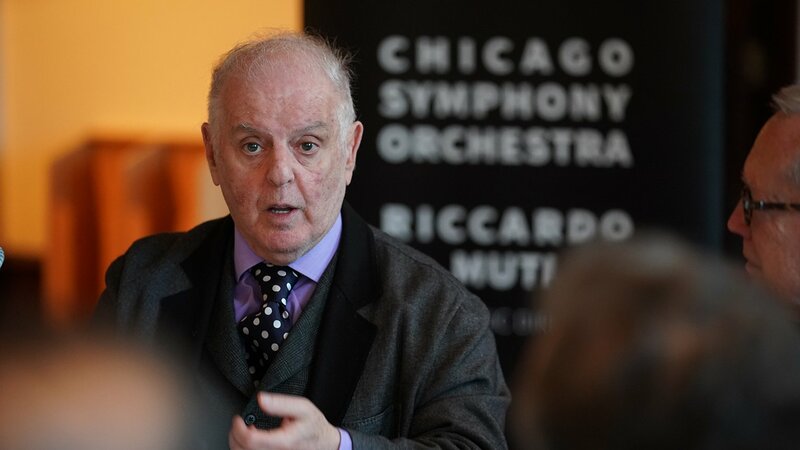 Adding to Barenboim’s enthusiasm about his Chicago visit is the fact that on Nov. 5 he will lead a performance by his West-Eastern Divan Orchestra, the ensemble of Israeli and Arab musicians he initially brought together in 1999 (along with the late Palestinian scholar Edward Said). Originally a workshop for young musicians from Israel, Palestine and several other Arab countries that was designed to promote intercultural dialogue, it has since evolved into a large, full-fledged orchestra with an education program. The Chicago concert, which will include two familiar works – Richard Strauss’ “Don Quixote” and Tchaikovsky’s Symphony No. 5 – will feature Israeli violist Miriam Manasherov and Iranian cellist Kian Soltani. It also will mark the first stop in a multi-city tour of the U.S. that will take the Divan (whose name is derived from the term for a legislative body in the Ottoman Empire) to the Kennedy Center in Washington, D.C., New York’s Carnegie Hall and the Walt Disney Hall in Los Angeles. “I was 15 years old when, in 1958, I made my Chicago debut in a piano recital at [what was then called] Orchestra Hall,” Barenboim recalled. He would go on to debut as a piano soloist with the CSO in 1969, and to conduct the orchestra for the first time in 1970. Barenboim confessed that he tries to keep music and politics separate when working with the Divan, and only a couple of musicians have left the orchestra. But he is under no illusion about it bringing peace to the Middle East. Barenboim grew notably despairing only when asked how he thought orchestras could engage younger audiences in classical music. All performances are at Symphony Center, 220 S. Michigan Ave. The CSO concerts ($39-$268) are Nov. 1 and Nov. 3 at 8 p.m. and Nov. 2 at 1:30 p.m. Running time is 77 minutes with no intermission. The West-Eastern Divan Orchestra concert ($40-$130) is Nov. 5 at 7:30 p.m. For tickets call (312) 294-3000 or visit www.cso.org.